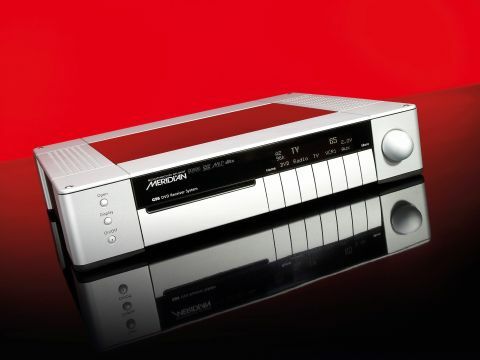 Linn did it a while back, Arcam just did it, and now Meridian is doing it too. It's the single box that offers CD and DVD playback, FM and/or DAB tuning, multichannel processing and amplification. Such products are clearly aimed at delivering an audio/videophile standard without a plethora of boxes and wires. Meridian's new G95 offers HDMI connectivity, DVD-Audio playback and upsamples both onboard sources as well as external sources. But, how does Meridian get so much into one compact but admittedly weighty case without compromising results? The secret to the G95 is digital (or, more accurately 'switching') amplification; Meridian has opted to use five Hypex output modules, which deliver 180 watts into four ohms. Despite the output, the casework remains nice and warm even in standby, but that's a function of the processor as much as amps. At its front end, the G95 offers a ROM drive. Press the open button and nothing happens, because there is no drawer, but rather a slot loading system. If it's robust enough for the car, the chances are it will outlast anything with a mechanical drawer. The ROM drive was chosen because of superior data reading capabilities; apparently it runs at standard speed, but can work a lot faster when it needs to make multiple attempts at reading a problem part of the disc. Something we noticed when comparing with a standalone player that skipped sections on the disc that the G95 just sailed through. As a disc player, it can deal with all the established AV and high-definition music formats save for SACD, but the latest Blu-ray and HD DVD video formats are not supported. It upsamples CD to 88.2kHz and thanks to the DSP processing onboard can present two channel media in either 5.1 surround, DPL II Movie or the three-channel stereo system Trifield, which is supported by Meridian more or less exclusively. On the video front, things are equally advanced thanks to Meridian's close ties with Faroudja. At the heart of this is a 'broadcast quality processor/scaler', which can provide a 1080p high definition output via HDMI. In essence this means that picture quality from DVD-Video gets about as good as it can get, which is impressive enough from a standalone player let alone a player/receiver. Videophiles will be wondering why there are no HDMI inputs for their HD satellite receivers and the new HD DVD and Blu-ray players. Meridian's solution here is its 421 (four into one) HDMI switching box, which connects to the Meridian comms socket and can be controlled via the G95 and its remote. This optional extra keeps the socket count (and the digital video processing) down to a minimum when not required. The tuner section gives the user two factory-fit options: the model we had was supplied with a combination DAB/FM module, but for a £100 less, you can ditch DAB and have an FM/AM RDS radio instead. This latter option is no off-the-shelf item either, it has its own 24/96 A to D converter, as well as a whistle filter in DSP for improved AM reception. Regardless of reception source, one nice touch here is that you can mix bands on your presets, so preset one can be XFM on DAB while preset two can be Radio 2 on FM etc. Setting up the G95 is marginally less intuitive than normal, but having a very early sample probably didn't help; the existence of settings marked Multichannel Analogue and Surround did put us wrong to begin with, but we got there in the end. Things were lubricated by the substantial remote handset supplied with the G series, it covers all the bases and yet manages to make the relevant keys easy to find, something that's all too rare with complex handsets and a good excuse for the unusually large size of the thing. In use, the G95 does not sound like it uses digital amplifiers. It has unusually well-defined, powerful and tactile bass - which is a digital trait true enough - but the high and mid frequencies are smoother and more solid than is often the case with digital designs. In fact, the overall balance is very much in the Meridian mould of being luxurious and a little smoother than neutral through the midband. This result does, of course, vary with the speakers used and was far more pronounced via B&W 802Ds than with PMC EB1s. The latter were not so well matched, their extremely open midband bringing out a slightly splashy quality to dense treble material that the 802Ds played down. This finding is slightly muddied by the fact that the EB1 encourages higher level listening and thus puts the amplification under more strain, and the source in a brighter spotlight. As there are precious few direct competitors to the G95, especially at this price level, it was difficult to compare it to anything in a meaningful way, but we had a go by stacking up a Cambridge 840A/C combo of CD player and integrated amp. Now, at £1,500 for the pair, these may seem to be in another league, but if you consider that the Meridian adds three more channels of amplification, DAB and FM tuners alongside a serious DVD player it doesn't seem so inappropriate. The face off showed the G95 to be more refined if less dynamic; it doesn't have the zing of the Cambridge pair, but the extra poise and reduction in 'transistor' character is very much in its favour. Pitting a Rotel RCD-06 CD player against the onboard transport revealed a similar result, but did suggest that the onboard amplifier is stronger than the transport when it comes to music. In other words, the Rotel sounds more alive and three-dimensional, even though it comes in as an analogue signal that goes through an extra A/D process. It's not limited to CD. This is the first DVD-A player we've come across that allows direct track access, which is a nice touch and encouraged a thorough investigation of our disc collection. The wider bandwidth of the format is reflected by greater treble extension and a more lively sound than it delivers with CD. It's still reticent by the standards of serious standalone players, but the quality of bass is a strongpoint, as is the ability to eek out plenty of space from acoustic recordings. It also makes a very good case for adding centre and rear channels; the combined effect being entirely enveloping with a good disc. With digital radio, the result is as good as we've heard from the medium, which means close to the quality one gets from a decent, if not outstanding, FM tuner. Here the medium is the limitation but the way that the G95 pulls solid and finely nuanced sounds from a very quiet background makes the format well worthy of your attention, especially when they play something good on Radio Three's Late Junction. As a DVD player the G95 is a very classy piece of kit indeed, Meridian's tie-up with Faroudja has clearly given it an edge in this rapidly moving market. We used a Loewe LCD screen with the HDMI connection and got a picture that minimised the artefacts that LCDs love to reveal and made superb use of the colour range this screen type is so good at. Skin tone is very accurately produced with none of the blotchiness that usually beleaguers DVD. It also coped extremely well with highly contrasting boundaries with little or no bleed of light into dark. Moving up to a Runco projector the similarity between the onboard upscaling of the player via HDMI and the scaling produced by the high-end projector via component was striking. We used the facilities at Brighton's Power Plant dealership to look at the G95's picture performance and everyone was impressed with the natural, precise images it produces.